Analog audio and video is being killed. By the end of the year component outputs will only support standard definition signals, and by 2013 component outputs and analog video will be gone forever. These statements are false. Are they lies designed to mislead the otherwise ignorant public? The reality–the truth–is that the “analog sunset” to which these ads allude affects only Blu-ray players manufactured and some Blu-ray content distributed after December 2010. The AACS License Agreement that Blu-ray uses stipulates that after 31 December, 2010, manufacturers must stop designing Blu-ray players with analog component HD output capability, and content providers will have the option (but are not required) to disable analog HD output on new Blu-ray discs. Further, Blu-ray players with any analog output capabilities cannot be sold after December 2013. This is a digital rights management restriction imposed only on Blu-ray technology and nothing else. That’s all. 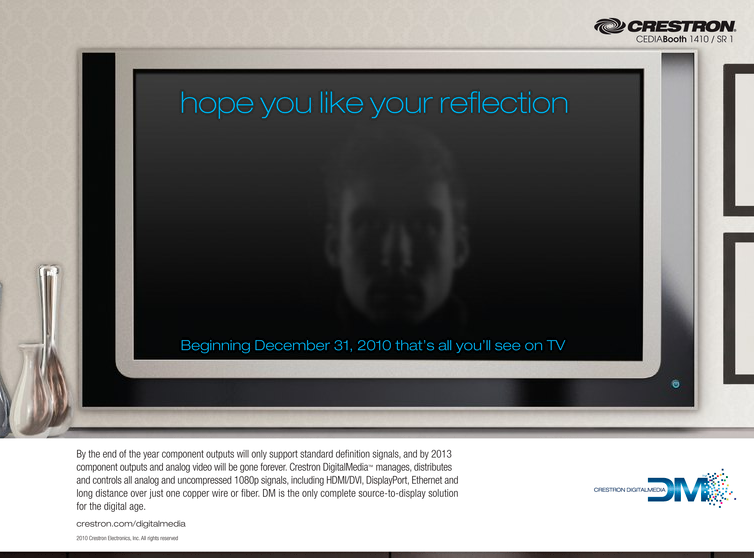 It’s baffling to me that Crestron would resort to such deceptive advertising practices. I understand that times are tough, but is misleading customers really the solution? These ads likely violate the Federal Trade Commission’s truth-in-advertising rules, satisfying key criteria in its policy statement against deceptive advertising. Primarily, consumers’ existing audio/video equipment is not going to suddenly stop working on 1 January, 2011, and the term Blu-ray doesn’t appear anywhere in these ads, even though that’s the only technology potentially affected by these ridiculous, fear-mongering claims. 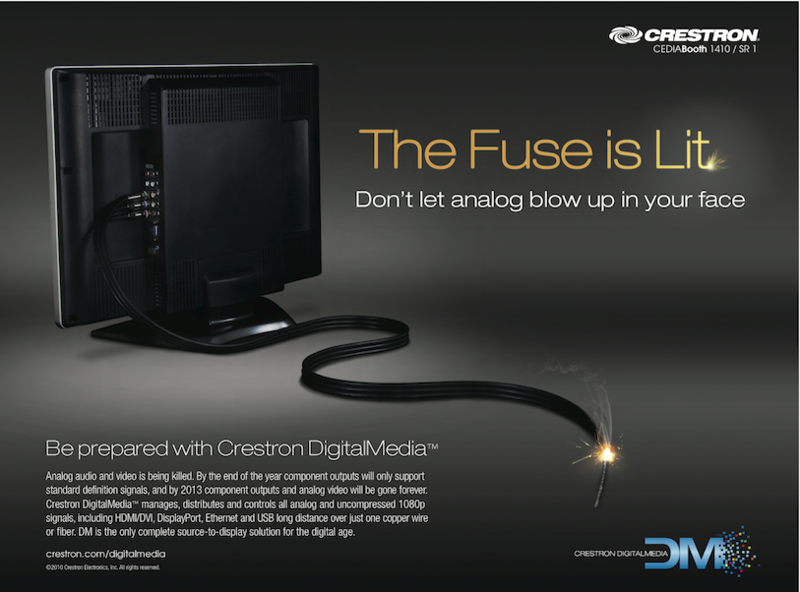 I can hope that people wise up and see through Crestron’s false statements. But I can also help. I can share this very information with Crestron, on my blog, on Twitter, and with the FTC. So that’s exactly what I’m doing. Universal Music Group recently announced DRM-free downloads through…who? Transworld, Passalong Networks, and Puretracks…who are these guys? There are some big brands, too, but who knew Google and Best Buy even sold music online? Rhapsody is about the only notable online music outlet in this line-up, but I don’t understand that choice, as most of their customers use Rhapsody as a music subscription service. Who’s missing here? Oh, right…the leading online music retailers, iTunes and eMusic. So in Universal’s infinite wisdom, it’s believed that the best way to test the market’s interest in DRM-free downloads is to try them out in the least-popular online outlets? This looks a lot like a lame effort put forth by the leading music company to appease the market interests, while not wanting to piss off its industry cronies. If [against all odds, based on relative traffic to these outlets alone] this trial is successful, Universal really has no choice but to move toward a DRM-free music model, leaving the remaining holdouts with little argument. On the other hand, if it’s a failure [as it’s more likely to be, considering the figures from the chosen outlets], Universal can claim that they gave it a try, but the “market” demand wasn’t sufficient. Clever. Disappointing, but clever. Twisted, sad, and deviant, but clever. I just visited guba.com because I heard that Warner Brothers was offering feature films online. What a great idea! Oh, wait…no, it’s not so great after all. Let me see if I understand this properly. I can pay $19.99 to download a video to my computer from GUBA OR I can just buy the DVD itself on sale somewhere for about $17. If I buy the film from GUBA, I get an encrypted file that I can only play on a Windows computer with Internet Explorer or on a Plays for Sure device–but not on a standard DVD player. If I buy the DVD, I can play it on any computer with any DVD player software and on any DVD player. Now…which option do you think I’m going to choose? I have to ask, “What were you thinking, Warner Brothers?” This is such a poorly conceived idea, it’s incomprehensible that anyone with any intelligence at any company could delude themselves into believing that this would be an attractive alternative for consumers. Why isn’t it, you ask? (1) This distribution model gives consumers fewer viewing location choices, completely eliminating the most popular one: the DVD player attached to the home TV. (2) The selection of Windows’ (and only Windows’) DRM alienates many tech-savy consumers who choose not to use IE, Media Player, and/or Windows itself. (3) The price point is completely out of line. Ultimately, consumers get less in this model, so they should expect to pay less. Do you want consumers like me to consider buying Warner Brothers content online? Here’s what you need to offer: For 9.99 or less, let me purchase and download a file that I can play on any computer or TV in my home from a central file system. For 4.99, let me download either Plays for Sure (Windows) or FairPlay-protected (Apple) versions of the content, targetted for smaller, portable devices at 320 x 240. Then, and only then, will I consider buying Warner Brother content online. Until that time, I’ll be sticking with DVD media. Want to let Warner Brothers know what you think? Leave them a message of your own. I am infuriated that you are backing new legislation that would further limit consumers’ use of copyrighted material in their own homes. It is incomprehensible to me that you might actually believe that consumers should just surrender control of when, where, and how they experience and enjoy the content for which they’ve purchased usage rights. Despite the pleas of consumers, of the tech industry, and of studies and scholars, this legislation broadly criminalizes what should be protected as fair use rights. It penalizes consumers in a desperate attempt at thwarting piracy, which you shamelessly masquerade as a defense against terrorism. Help me understand, please, why I shouldn’t be able to watch the movie I purchase in any room in my home on any device of my choosing. Help me understand why it should be illegal for a parent to protect their investment in DVD movies by backing them up in preparation for the day that the original media gets scratched, cracked, or lost at the bottom of a toy box. Help me understand why copying a movie from an owned DVD to a mobile video device so as not to have to take a laptop through the TSA’s airport security lines makes someone a criminal. Help me understand why we the consumers must suffer for the recording and film industries’ failure to keep up with the market established by and for digital media. Criminalizing consumers’ attempts to use content fairly is not going to catch terrorists. Nearly every independent study and nearly all evidence shows that piracy is not prevented by digital rights management (DRM). The content pirates you seek to defeat are not deterred by DRM. Invariably, these controls all can and will be cracked by the organizations that stand to make money by doing so [oh, wait, could I perhaps be arrested now for suggesting that possibility?]. The only real effect that DRM and the ridiculous legislation the content industries have lobbied so hard to introduce actually has is to inconvenience consumers and reduce the value and usefulness of the content you’re trying so hard to protect. These consumers are your children, their children, your neighbors, and your friends. That’s who this legislation will hurt—not the real criminals. I suggest that you take a step back from the special interests of the RIAA and the media moguls to start thinking about protecting the people you’re elected to represent—the citizens of this country…the consumers. By backing this legislation, you are clearly not acting in their best interests. I am disappointed and outraged that Philips has pursued patents on technologies that could significantly limit consumers’ control of their television viewing experience. While I understand your assertion that you have not yet implemented nor do you intend to implement such technologies in your devices, I have read the patent applications, and the language is very clear. The technology described in Philips’ application would essentially provide broadcasters with an extortionist approach toward television advertising: Watch the ads or pay! And as if preventing fast-forwarding in recorded content isn’t bad enough, the application describes technology that could hijack consumers’ hardware by disallowing them from changing channels during advertising! That is completely unacceptable. How dare manufacturers and content providers even consider such technologies? It is outrageous. Philips must truly disrespect consumers to pander so significantly to content providers and advertisers. I am planning to purchase a new television in the coming months. I am an early adopter who spends thousands of dollars annually on consumer electronics. Because Philips might even contemplate technologies that could so significantly limit my usage rights as a consumer, you can be assured that I will not now ever consider purchasing products from Philips—not televisions, not kitchen appliances, not light bulbs. You, as a company, have completely lost my business. LIVE from SXSW, It’s the Ritual Misery Podcast!